Rocks are generally not very exciting. They just… sit there. However, boulders can be very versatile when it comes to landscaping. 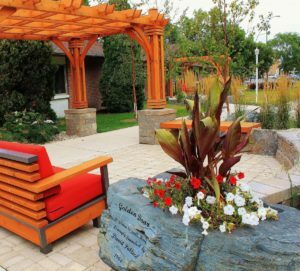 We often use boulders in our designs, as they have beautiful colour variations and come in many different shapes and sizes.You generally have the option of using granite (black, red), limestone, or fieldstone. Each type has its own distinct look. 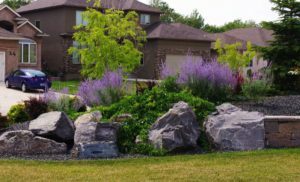 Here are some different ways in which you can incorporate these magnificent boulders into your yard! 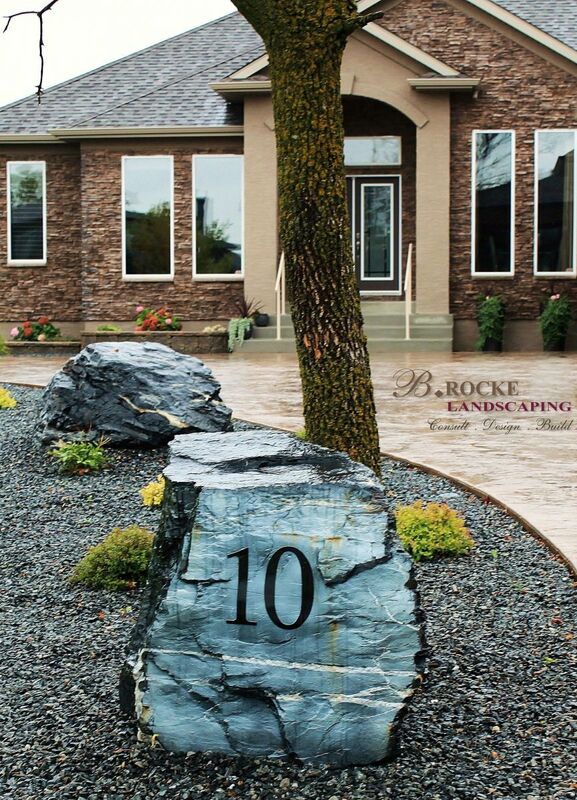 Large boulders are great to use in the front yard. 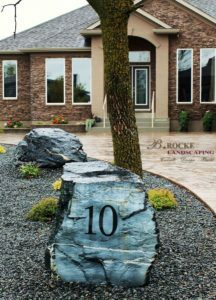 Your address can be engraved right into the boulder or, for a more cost effective option, aluminum address numbers can be installed directly onto the boulder face. Whether residential or commercial, having a custom feature like this on your property will definitely make a statement! For clients who are trying to achieve a more natural look in their yard, we will often suggest a boulder retaining wall. Whether you are using rounded Fieldstone boulders, or going for a more modern look with the jagged Black Granite boulders,they all come in many sizes, making it easy to piece them together in a way that is both functional and beautiful. 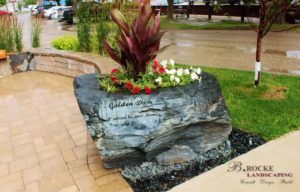 A boulder wall can be used as a retaining wall, or added as a purely decorative feature to separate two sections of your yard. If you are planning to use manufactured wall blocks to create your retaining walls, boulders are also a great way to finish off the wall ends. That way you get a combination of man-made and natural elements in your design. A great way to soften up the look of the boulder is to turn it into a planter. With a fair bit of sweat, strength, and a couple of saw blades, we are able to carve out a hollow in the boulder which can be used to plant annuals. Combining the hard look of the boulder with the softness of the plants is a great way to fuse different materials, textures, and colors into your space. 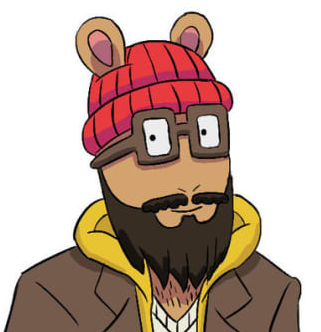 Check out our next post for even more boulder ideas!